Based on Intellij Idea Community Edition, this new environment acts as a WYSIWYG for making applications, basically, giving you a chance to make updates and get a review progressively, boosting benefit and making it less demanding to fabricate delightful looking applications with a touch less venture. There's a wide mixture of emulators for seeing applications, so regardless of the fact that you don't have a specific gadgets available, you can in any case determine everything's functioning as proposed. Additionally on showcase today was another growth comfort, presenting enhancement tips, income diagrams, beta-analyzer control and utilization measurements pulled from examination. All of these characteristics will make things less demanding to operate for visionaries, giving them more time to create more polished apps that work well on a variety of Android devices. Looks like Jetbrains and Google are dancing. It's kind of amazing how people get so excited by "new" technology that has actually been around on other platforms for more than twenty years. Not new as a technology, but new to Google. Android has been available for how long without Google making a real IDE available? That's pretty sad. An IDE should be the first thing that someone makes available when introducing a software platform. I'm ok if at least it doesn't crash so much as Eclipse does. Though I don't see any reference to native code compiling, probably they think that using a palette similar to VS2012 is enough to be similarly good? But that would be like those newbies who thought that by calling "Syndicate" to a horrible first-person shooter, the game should be as good and successful as the original classic. 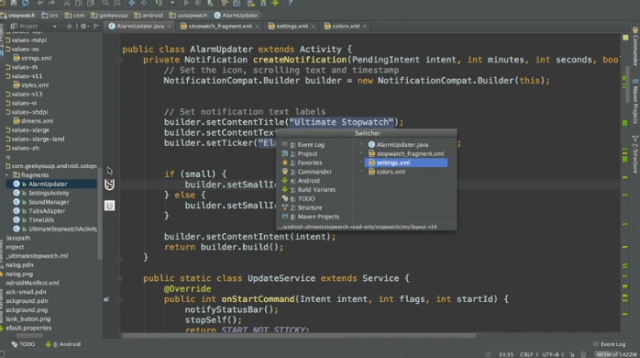 It's a pumped up Intellij IDEA, which can already be used to develop for Android and some prefer it over Eclipse since day 1. Really don't understand, why most still use the sluggish Eclipse, considering that most of Google's own developers used Intellij IDEA before hand.